While Mario, Zelda and Metroid are usually seen as the ‘main events’ of any Nintendo console, it’s Kirby who has traditionally performed the curtain-call. Whenever Nintendo’s ‘big three’ are preparing for the next console in line, it’s Kirby who is holding down the established fort to give it one last hoorah. This tradition goes all the way back to the NES, when Kirby’s Adventure closed the book on Nintendo’s trailblazing home console. The year was 1993, the Super Nintendo Entertainment System and the Sega Genesis were well established by this point. With everyone invested in sixteen bit consoles, Hal Laboratory made the bold decision to release the second entry in their Kirby franchise on the nearly decade-old NES. It’s a gamble that ultimately paid off, however, as Kirby’s Adventure proved to be a fitting swan-song for the NES, one which could hold its own amidst the sixteen bit giants of the time. Despite being Kirby’s second outing, Kirby’s Adventure feels more like the true beginning of the series. It was here in Adventure where Kirby could gain the abilities from the foes he inhaled. It also introduced the majority of Kirby’s classic rogue’s gallery (including the first appearance of Meta-Knight), as well as establishing King Dedede as a more comical, secondary antagonist, with a greater cosmic threat working behind the scenes (which has since become common place for the series). 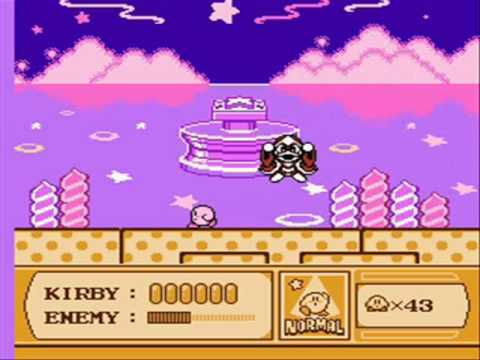 Dream Land may have been the original template, but Kirby’s Adventure is where Nintendo’s pink hero found his identity. Being released at the tail-end of the NES’s lifespan, Kirby’s Adventure brought out the very best in the system’s capabilities.It wouldn’t be a stretch to say it was the most graphically impressive game on the console, with large, lively sprites, colorful environments, and even some special effects you wouldn’t think the NES was capable of (including rotating objects that would look more at home on the sixteen bit consoles of the time). Kirby’s graphical fidelity is matched by one of the NES’s best soundtracks, which includes the origins of many of the series’ most iconic tracks. It is of course in gameplay where Kirby shines brightest. 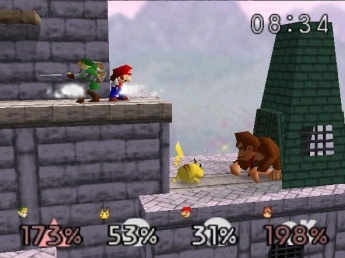 His newfound copy abilities – of which there were 24 in their debut showing – made the gameplay substantially deeper and more varied than Dream Land. 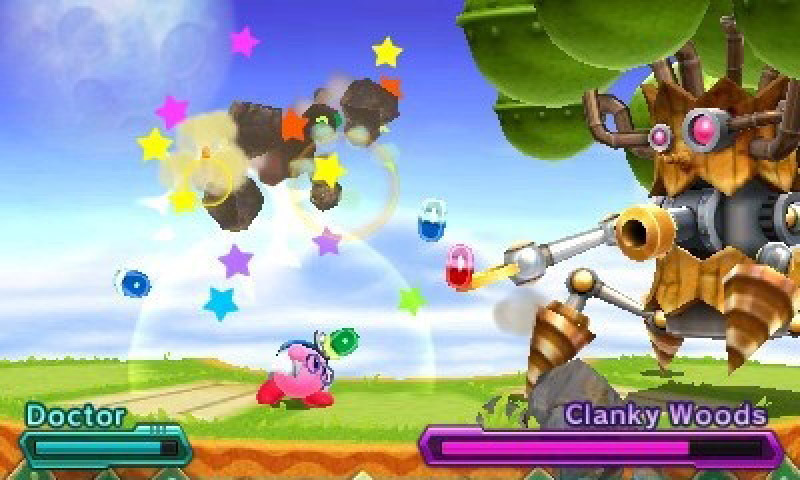 Hal implemented these abilities wisely, making Kirby’s Adventure a platformer that emphasized combat over actual platforming (seeing as Kirby can just fly over obstacles anyway). 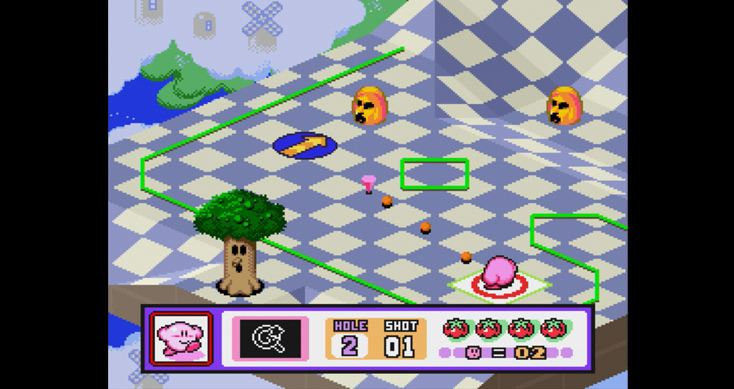 While later entries in the series would expand upon Kirby’s arsenal (the abilities here are one move apiece), Kirby’s Adventure used what it had to its fullest, even providing some rooms in between stages that simply gave Kirby access to some powers, that he might take one and unleash it upon the stages at his leisure. The overall adventure is admittedly a bit brief, but pretty deep for an NES title. It will only take a few hours from starting Kirby off on his journey to his final confrontation with the Nightmare that threatens Dream Land. An additional difficulty setting, boss rush and sound test can be unlocked – foreshadowing the series’ eventual love with additional content – but you may wish there were more secrets to uncover in the main story mode other than a few different mini-game segments (Mini-games which, admittedly, might be the weak point of the game). Kirby’s Adventure may have since been bettered by some of Kirby’s later, well, adventures (with Kirby repeating his ‘late to the party’ excellence on the SNES, N64 and Wii to great effect). But Kirby’s NES outing remains a definitive entry in the series. It’s Kirby in his purest form; blast through stages as the overpowered puffball, steal enemy abilities, and wreak havoc upon Kirby’s foes by giving them a taste of their own medicine. The formula may have been bettered with subsequent entries, but Kirby’s Adventure has aged gracefully, perhaps more so than any NES title that doesn’t have the names ‘Mario’ or ‘Mega Man’ attached. The NES was a console that introduced the world of gaming to many of its biggest names. Kirby played a bit of role-reversal, however. Kirby began life on the Game Boy, but with his second outing, he gave the NES a new breath of life. By 1995, Kirby had quickly established himself as one of Nintendo’s premiere franchises. 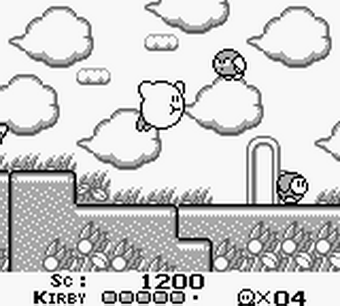 Kirby’s Dreamland, though simplistic, found an audience due to the popularity of the Game Boy. 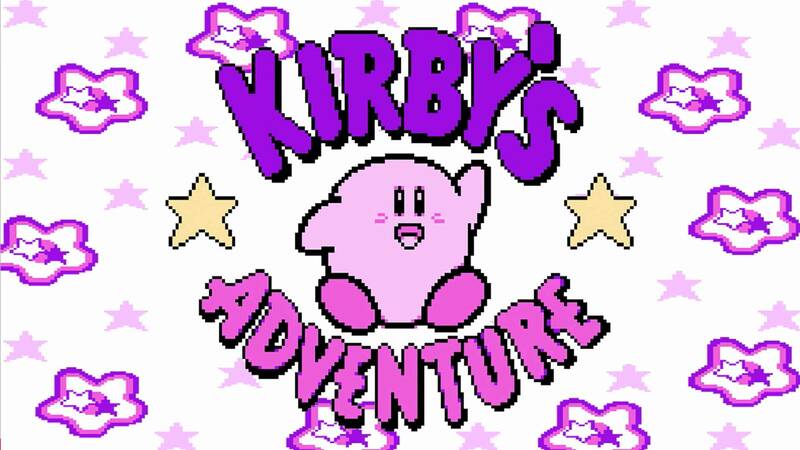 It was with the 1993 NES sequel Kirby’s Adventure where the series really found its stride. Adventure gave Kirby his synonymous copy abilities, which in turn gave the series a stronger sense of depth in gameplay. Kirby had shown up in a few spinoff titles after his NES outing, but after three years it was time for the original Kirby’s Dream Land to get a proper follow-up. 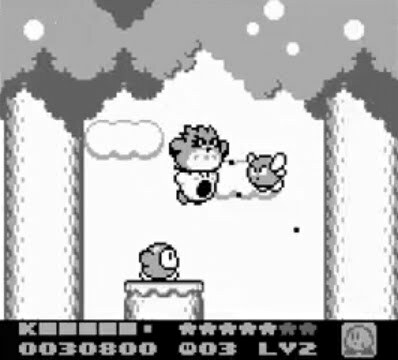 Kirby’s Dream Land 2 arrived on the Game Boy in 1995, and although it is a fittingly small game due to its hardware, its overall quality has held up almost shockingly well over the years. Kirby’s Dream Land 2 adopted Adventure’s copy abilities, solidifying the mechanic as Kirby’s staple. 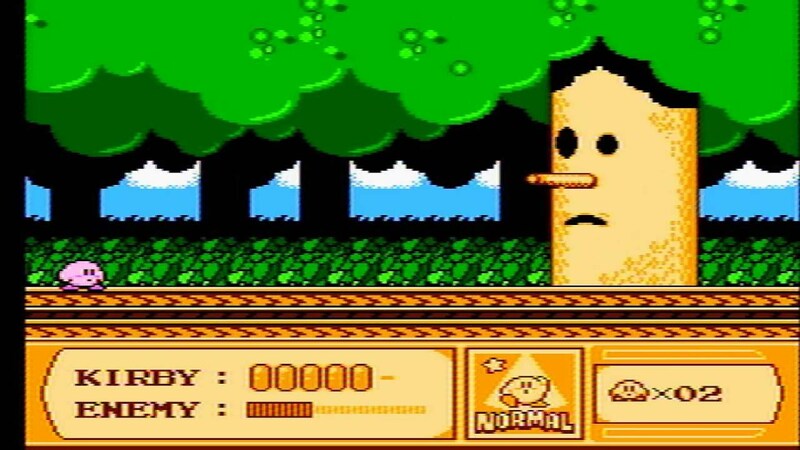 Of course, the Game Boy had more limited capabilities than a home console, so the number of copy abilities were lowered to seven: burning, cutter, spike, ice, spark, stone and parasol. To compensate for the reduced number of powers, Kirby was given three animal friends for Kirby to ride (a la Mario and Yoshi), with each animal friend altering the copy abilities. Rick the hamster, Coo the owl, and Kine the fish all join Kirby on his second Game Boy adventure. Rick travels faster on land than Kirby does on his own, while Coo takes to the air and Kine makes swimming sections a breeze. Best of all is that the game makes good and varied use of every animal friend. If you want you can stick with your preferred animal friend for most of the game, but certain secret areas will need the use of particular animals and/or powers to access. While most such areas provide hidden 1-Ups and similar items, certain levels contain an extra secret ‘Rainbow Drop,’ which are required to face the secret final boss. Dream Land 2 is a much bigger game than the original. While the first Dream Land simply featured five short stages, Dream Land 2 contains seven worlds, each with multiple stages of their own. It still will only take players a couple of hours to finish, but things feel a lot more like a complete adventure this time around. One stage in each world hides a Rainbow Drop, with the later drops being particularly difficult to find (often requiring you to have a particular animal friend and power just to find a clue, let alone the drop itself). If you find them all and defeat King Dedede, the true final showdown against Dark Matter takes place. Some may wish that there were more hidden trinkets than simply one per world, but when you consider the limitations of the Game Boy, it’s actually quite impressive how much Kirby’s Dream Land 2 managed to pull off. 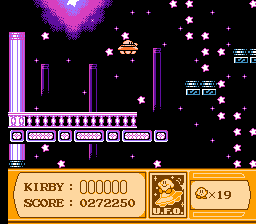 Even Kirby’s Adventure had you go directly from Dedede to its big bad by default, so the fact that Dream Land 2 had you uncover secrets in order to obtain that final challenge was novel at the time. 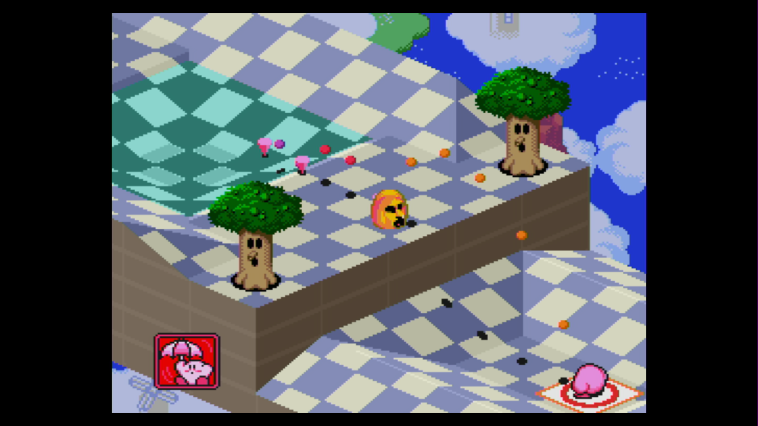 Of course, being released on the original Game Boy, Kirby’s Dream Land 2 is not a particularly pretty game to look at. On the plus side, it was released late enough in the Game Boy’s life to take full advantage of the Super Game Boy (an SNES attachment that allowed you to play Game Boy titles on the console, with added color). 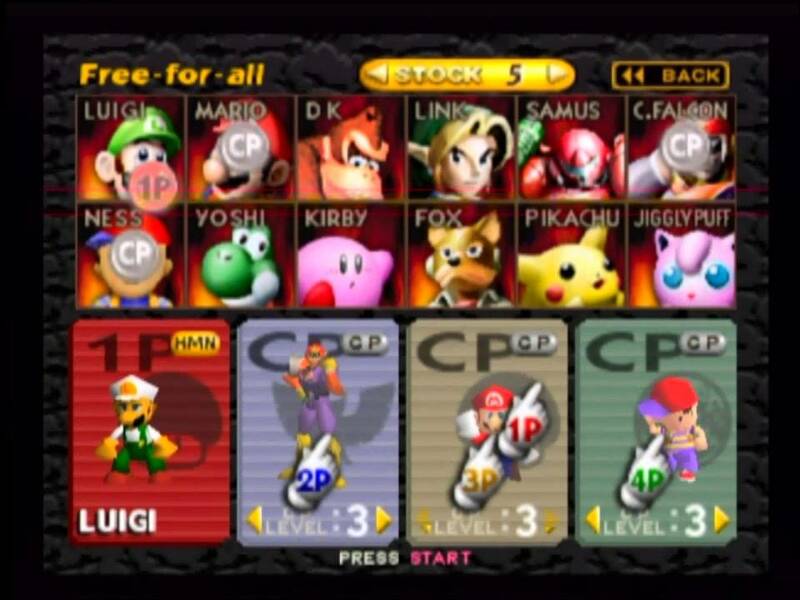 This means that the added colors could later be found when playing the game on a Game Boy Color, Game Boy Advance, or in one of its later re-releases. It may not match the visual charm of Kirby’s Adventure, or the outright timeless graphics of the later Kirby Super Star or Dream Land 3 on the SNES. But if you manage to play Kirby’s Dream Land 2 on the proper hardware, it’s one of the few original Game Boy games that isn’t a total eyesore. What Dream Land 2 lacks in visual fidelity, it makes up for in one of the Game Boy’s best soundtracks, with that distinct Kirby charm permeating through every tune. Each animal friend even gets their own theme (with Coo’s being the best). Kirby’s Dream Land 2 may not match the “fire on all cylinders” feeling of Kirby’s Adventure, and it goes without saying that later entries topped it. But the core gameplay is fun and deep enough to make Kirby’s Dream Land 2 one of the few titles for the original Game Boy that has held up incredibly well. It’s still a lot of fun. The Nintendo Game Boy became a video game phenomenon. Taking video games on the go was a revelation, and Nintendo took full advantage of it by giving their established series handheld iterations on the Game Boy. But the accessibility of the Game Boy also opened the door for Nintendo to create new franchises on the console, an opportunity that would lead to the creation of Pokemon and Wario. Among Nintendo’s franchises that began life on the Game Boy was Kirby, who has remained one of Nintendo’s most reliable names ever since. It all began with Kirby’s Dream Land in 1992. Though the original Dream Land may be incredibly simple when compared to later entries in the series, it still succeeds in what it initially set out to do: be an introduction to video games. It’s true, while Kirby has become one of Nintendo’s most enduring series, it’s original title was created for the purpose of being a kid’s first video game. If young audiences found the later levels of Super Mario World too difficult, they could instead play Kirby’s Dream Land to get a better understanding of how games work. In this sense, Kirby’s Dream Land remains a roaring success. 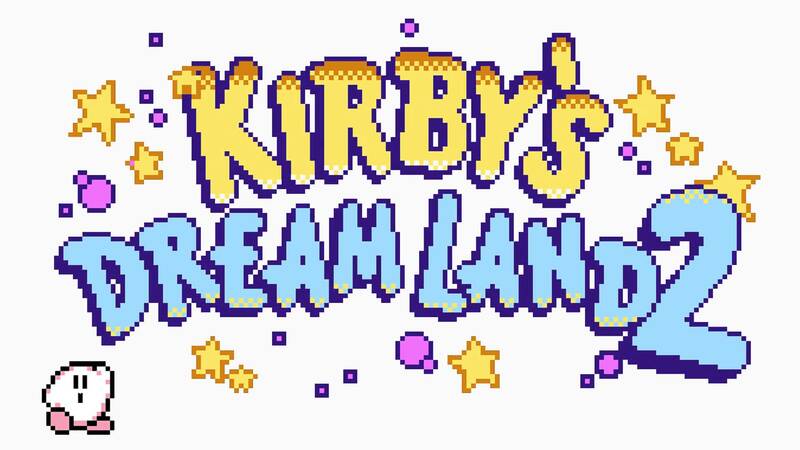 On the downside, that also means that Dream Land is an incredibly simple game that lacks depth, which is only more apparent today seeing as modern Kirby titles throw in as much extra content as possible. Yes, Kirby’s original game is only five stages total in length. And more notably, while Kirby could still inhale enemies in his debut outing, he could not yet steal their abilities by doing so (that would be an innovation of the more substantial Kirby’s Adventure, released one year later on the NES). Kirby’s Dream Land can be completed in well under an hour, with an ever-so-slightly more challenging mode being unlocked upon completion. It wouldn’t be inaccurate to say that Kirby’s Dream Land is as bare-bones as it gets. But at the same time, it still controls pretty well for a game originally released on the Game Boy. Perhaps more importantly, not only would it serve as a great introduction for young children to the world of video games, but if you’re interested in game design itself, Kirby’s Dream Land may also serve as a nice first-step in that regard as well. What Dream Land lacks in depth, it makes up for in its sense of education to how games work. The layout of the stages and enemies serve as a study to the game’s mechanics (and by extension, the mechanics of platformers as a whole). 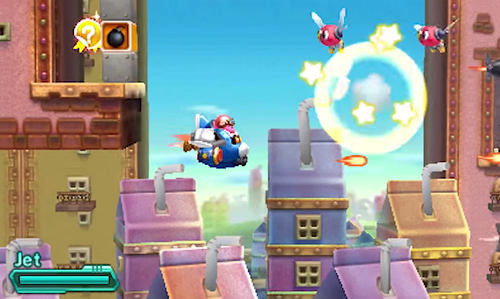 And each subsequent stage introduces some new gameplay elements (including a space shooter segment, food that give Kirby new abilities, and a boss rush final stage). Yeah, it is a little cheap that Kirby can pretty much avoid any non-boss obstacle in the game by flying (later entries would provide enemies and hazards to prevent such an exploit of Kirby’s powers), but again, this was a title designed to introduce young children to the medium. Kirby’s Dream Land may not be the most timeless of Kirby titles. If anything, it’s utter simplicity compared to its sequels and spinoffs may retroactively make it the weakest entry in the series. 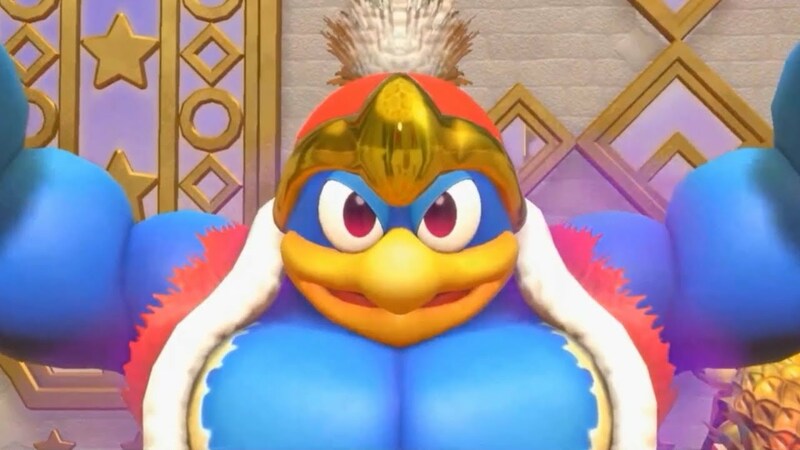 But it’s hard to be too critical on a game that’s simply trying to open the door for children to get into gaming, and the soundtrack holds up nicely (King Dedede has the longest-standing theme music of any video game character for good reason. His theme is awesome!). Kirby’s first adventure may not be a classic, yet it still has its charms. It can’t be stated enough that Kirby has always been the unsung hero of Nintendo. The pink, spherical star warrior has often been in the shadows of Mario, Zelda and Metroid, while quietly providing consistently entertaining and innovative experiences. So while Kirby may be relatively under the radar, he still deserves recognition for being one of Nintendo’s brightest stars. Kirby’s debut on the Nintendo Switch, Kirby Star Allies, continues the pink hero’s impressive resume. By combining elements from various titles from Kirby’s past, Star Allies provides a consistently fun experience that should rank as one of the highlights of the long-standing series. Kirby Star Allies brings a traditional sidescrolling Kirby platformer to a home console for the first time since 2011’s Kirby’s Return to Dreamland on the Nintendo Wii. 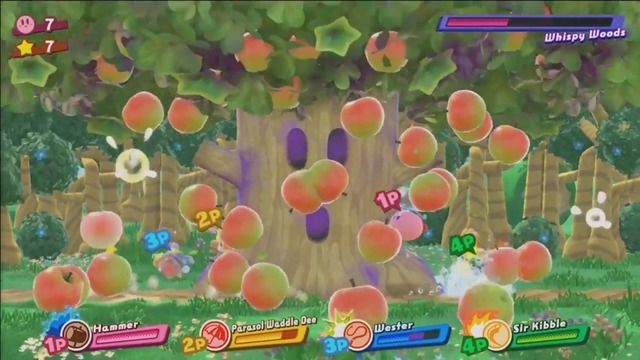 Like Return to Dreamland, Star Allies turns the Kirby experience into a multiplayer romp for up to four players. 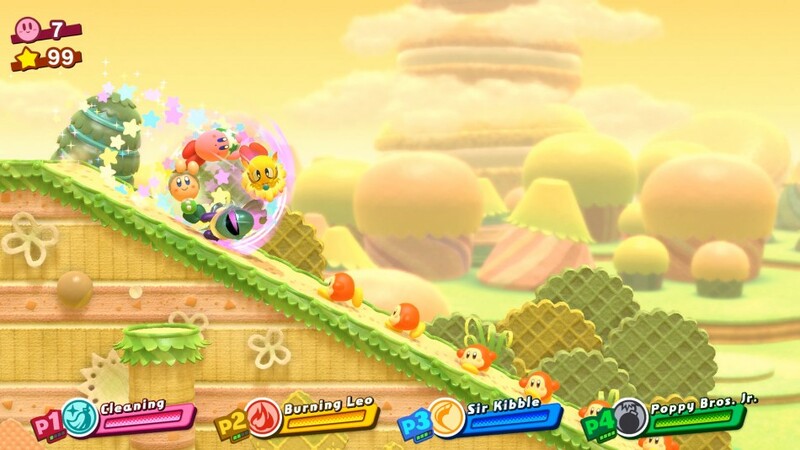 But while Return to Dreamland saw three additional players take control of Waddle Dee, Meta Knight and King Dedede, Star Allies takes a page out of fan-favorite Kirby Super Star’s playbook and allows Kirby to turn his standard enemies into partners (in addition to being able to copy their abilities). Waddle Dee, Meta Knight and Dedede are still available after certain points of the game, should players want to play as one of the series’ mainstays. But combining Return to Dreamland’s multiplayer setup with Super Star’s enemy-to-allies mechanic is Star Allies best hook. 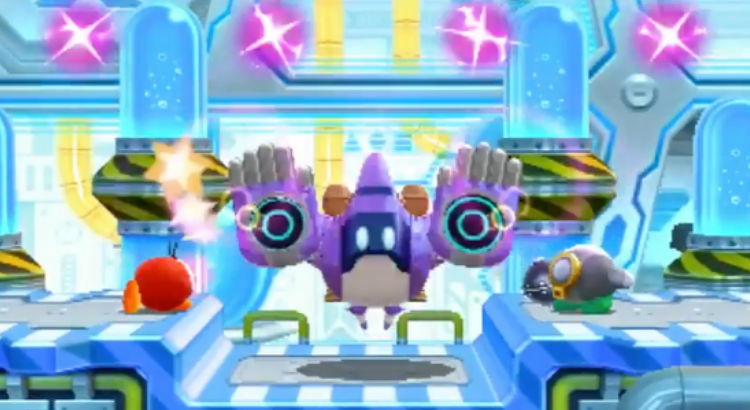 Continuing in resurrecting elements from Kirby’s past, Star Allies also finds a means to bring in a sort of successor to Kirby 64’s ability-combining mechanic. 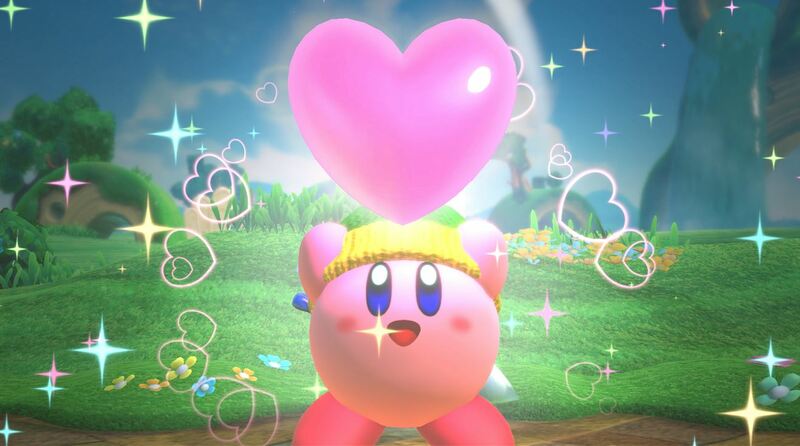 Kirby can throw hearts at enemies to bring them to his side, and if Kirby’s team boasts the right combinations, they can work in tandem to create new powers. Elemental abilities like fire, ice, water, spark and wind (available via the broom and bird abilities) can be added to weapon-based powers such as the sword, hammer, yo-yo, whip and ninja. 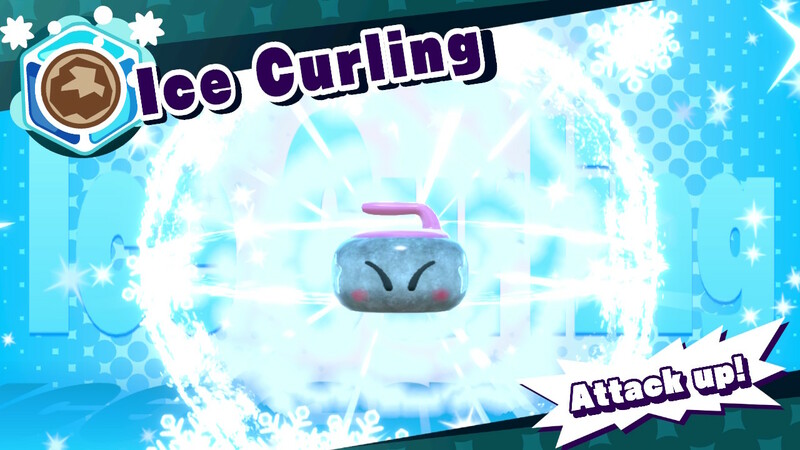 Other powers can be combined for one-time special attacks (such as spark and water, which send electrified splashes at enemies for extra damage). And other powers still have unique combinations with each other, such as the ESP ability (returning from Planet Robobot) being able to join with the rock ability to perform geokinesis. It may be a little disappointing to know that not all of Kirby’s abilities can combine with each other in the same way they could in Kirby 64, but finding which abilities go together and what they produce still makes for a constantly surprising and fun experience in Star Allies. Of course, there are a few new copy abilities thrown into the mix as well: Artist allows Kirby to attack with a paintbrush, as well as send sentient paintings and sculptures at foes. The spider abilities sees Kirby trapping enemies in webs, as well as providing trampoline-like webs for his friends to jump on. And the staff ability has Kirby walloping baddies with a bo staff. These new abilities join a host of recently returning and long-standing favorites, making for one of the most robust libraries of copy abilities Kirby has ever seen (as well as giving players two through four plenty of character options). That’s really the core of Kirby Star Allies: working together as Kirby and his friends (who can be controlled by surprisingly competent AI when playing solo) to work as a team to gain new powers and to complete the game’s stages and solve its puzzles. 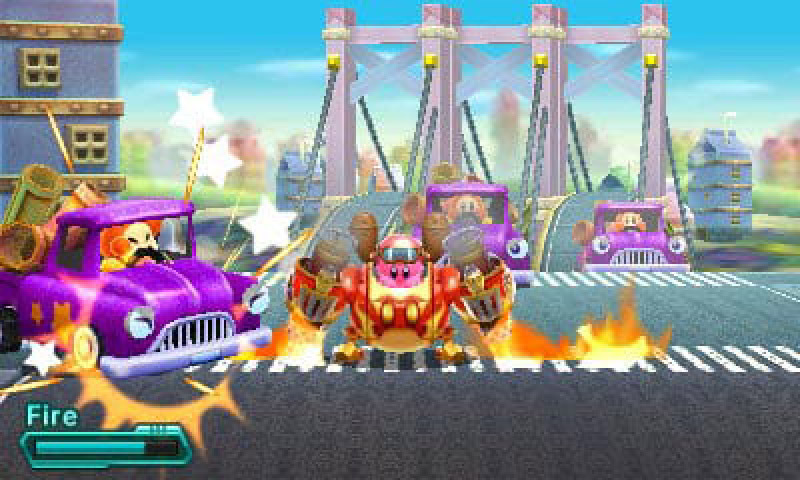 There are even sections in which Kirby and company will join forces to create bridges, form a wall-climbing train, form a wall-breaking wheel, and piloting a star (for some shoot-em-up action). The experience is consistently fun and enjoyable, and will surely leave a big smile on your face. The level design and gimmicks are varied, and though the adventure may sound short on paper at only four worlds, these worlds differ greatly in the number of levels they house, with myriads of secret stages being tucked away in each, should you be able to find their switches hidden in the standard stages. Star Allies even breaks tradition by not saving a singular boss fight at the end of each world. Instead, a number of levels end with a boss fight, and although they aren’t particular difficult (the penultimate boss was the only one that killed me in the adventure mode), the game is pretty generous with how many of them it provides. The final boss, in particular, provides one of the grander set pieces in the series’ (and Nintendo’s) history. The easy difficulty extends past the boss fights, and indeed the entire adventure mode is a bit of a breeze. That should be expected from Kirby games by this point, and isn’t really a bad thing on its own. However, while past Kirby games have offered a host of hidden collectibles to add an extra challenge for completionists, the only hidden trinkets of Star Allies are puzzle pieces, which only unlock pieces of art work that celebrate Kirby games of the past (a fine unlockable for anyone who appreciates such things like myself, but I’m not sure they’d be incentive enough for most players to go through the trouble of seeking them out). A few extra collectibles – such as the strangely absent music tracks of past titles – could have made for an additional challenge in exploration. If it is a challenge you want though, Star Allies follows suit with the more recent Kirby titles in providing a host of post-game modes which add some extra difficulty. But perhaps in the future it might be a nice option to have a more difficult mode available from the get-go. Still, it’s always hard to complain too much about Kirby. Not just because the adorable characters and colorful worlds make it all too easy to smile, but because they have always provided such strong, straightforward fun. And Star Allies is certainly no exception. The charming and creative gameplay of Star Allies is joined by some truly impressive visuals (my goodness, the water effects!) and, like most Kirby games, a beautiful musical score that will, sadly, probably become underappreciated (the game playfully uses orchestral pieces for most stages, whether original or remixed tunes, while the aforementioned secret stages pull a classic track right out of Kirby’s past). Kirby Star Allies is perhaps not the most original Kirby title: utilizing elements from Return to Dreamland, Kirby 64 and Super Star (as well as the cancelled GameCube Kirby title). But it uses these bits and pieces to create something of a Frankenstein’s monster that provides one of Kirby’s most fun adventures, while also celebrating the series’ storied history. And frankly, Kirby’s is a history that doesn’t get celebrated nearly as much as it deserves.